Each work of art recovered from the flood comes with a personal description: its history and how it was restored. The Museum�s new design and layout allows the visitor to both admire and �live� the art, thanks to information boards and individual descriptions of the masterpieces in each of the various exhibition halls. The return of these 19 works of art, forty years after the flood, has restored the Museum to its former glory, and the Santa Croce Museum is also undergoing new and important development supported by the most up-to-date technology. Innovative software will soon be up and running to create a digital archive of images faithful in terms of both colour and proportions. All related restoration work and research will also be archived and catalogued, to be made available to scholars and the public. The redesigned Museum also comprises a special section dedicated to works restored by the Pietre Dure workshop, whose efforts have made it possible to admire, once more, eight masterpieces that were believed to have been damaged beyond repair. The Museo dell�Opera: 106 years of history. The Museum was founded on the 2nd of November 1900 by Guido Carocci, who converted the Refectory, the Cenacolo, previously used as a storeroom for paintings and objets d�art, into a public exhibition hall. When a large restoration and redesigning project began on the church and cloisters in the mid-19th century, columns, capitals, family coats of arms, altars and other articles were all deposited in the old Refectory. 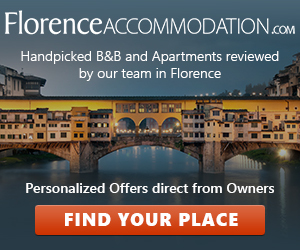 This room was also used to store sculptures and fragments of frescos from Florence�s demolished historical centre, and some of these were kept permanently in Santa Croce. After its first inauguration, the Museum was filled with paintings, sculptures, bas-reliefs and frescos that gradually came to light during continuous restoration work on the Basilica. The new museum, managed by Luciano Berti, was inaugurated on the 26th of March 1959 with an exhibition of frescos from Orcagna, parts of the Church�s stained glass windows, Donatello�s statue of San Ludovico, various broken-off frescos and the Crucifix by Cimabue. The Museum was expanded in 1962: it was extended into the Refectory and the five adjacent rooms. The Museum was closed for a long time after the flood in 1966. It was rearranged and then reopened in 1975, and the impressive Crucifix by Cimabue was returned, a decade after the tragedy. In 2006, with the masterpieces back in place, the Museum looks new again. The masterpieces Hall 1 Saint Ludovic of Toulouse, Saint Agatha and two angels beside a cross, workshop of Jacopo Da Empoli, oil on canvas, early 17th century. The painting was an altarpiece in the Bardi di Vernio chapel, in the left transept of the basilica, and served as a backdrop to Donatello�s Crucifix, installed in the late 16th or very early 17th century. When the chapel was transformed by the restoration work in the 20th century, the canvas was transferred to the museum and was inventoried in 1916. Ciborium, by Matteo Nigetti. 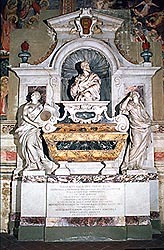 Polychrome marble, golden bronze and silver. Brought to Santa Croce in 1815 after the Napoleonic wars, it was placed on the altar in the Castellani Chapel, where it remained until 1973. The ciborium was then removed during restoration of the Chapel, which was to be redesigned for the cult of the �Santissimo Sacramento� on the directions of the Second Vatican Council. The Ciborium was therefore stored on the premises, only to be displayed at the museum in the early 1980s and transferred to the Pietre Dure Workshop for restoration. The choice of valuable marble and the manner in which it was sculpted are in keeping with the style of Matteo Nigetti and the hand of the Pietre Dure Workshop, at the time of work on the Cappella dei Principi in San Lorenzo around the mid-17th century. �Cacciata di Gioacchino dal Tempio�, attributed to Giambologna, end of the 16th century, terracotta bas relief. This splendid panel, which may have served Giambologna as a preliminary basis for a bronze, was stored for a long time in the Museum. Exposed to the ravages of time, it fell into appalling condition and broke into several fragments, but has now been fully and delicately restored. The �Cacciata di Gioacchino da Tempio� is displayed at the Museum next to another terracotta panel of similar size depicting the Encounter between Gioacchino and Anna. �Encounter between Gioacchino and Anna�, attributed to Giambologna, end of the 16th century, terracotta bas relief. A pendant to the other panel, it may have been part of a series of stories about the Virgins. Assumption of the Virgin, Giuseppe Bezzuoli, 1840, oil on canvas. The painting, with a golden and intricately engraved frame, was originally on the altar of Giugni-Bonaparte Chapel in the transept of the Basilica � where it remained until the early 20th century � and then transferred to the Museum. Damaged by the flood, the painting marks an interesting stage in the work of Bezzuoli, an academic who trained as a painter under Benvenuti, became known also as a decorator and portrait artist and worked both in and outside of Florence. Strongly inspired by the neo-baroque style, he expressed a tendency for formal simplification in contrast with the dominating historicist movement. �The Trinity of Saints Benedict, Francis and Bartholomew and John the Baptist� by Neri di Bicci, tempera on board with gold frame, 1461. Commissioned in 1461 by Bartolomeo Cederni, the painting was originally intended for Chiesa della Badia, in Florence. 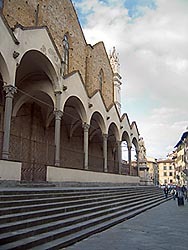 It was transferred in 1814 to Santa Croce after the Napoleonic wars, exhibited in the Cappella del Noviziato of the Basilica and then in the museum, where it remained until 1966. Damaged by the flood, the painting was sent to Limonaia di Boboli for renovation and then transferred to the workshops in Fortezza da Basso, where one half-hearted attempt was made at restoring it before putting it into storage. �Saint Matthew and two angels holding a curtain�, by a 16th century Florentine artist (with 19th century additions), oil on canvas and tempera on board. 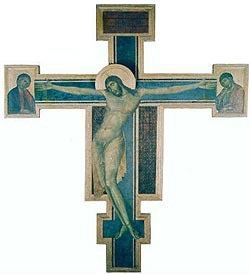 The painting originated from the Morelli-Gherardi Chapel, the right-hand transept of the Basilica. Restoration has revealed that the use and form of the work was changed before 1845, but is still considered of great interest and quality. The painting was transferred to the Museum when work started on the chapel where it was kept originally. �Madonna with child, Sainted Bishop and Saints Benedict, Joseph and Bernardo di Chiaravalle�, by a late 17th century Florentine artist, lunette, oil on canvas with golden inlaid frame. Little is known about the painting. Its shape suggests it might have been used above a door, the depiction of Saint Benedict, however, might imply that the purchaser was not necessarily the Franciscan convent and could, therefore, have been sent to S. Croce after the Napoleonic wars from somewhere else, such as Badia, where other works of art at the museum had originated from. �Mourning Madonna�, attributed to Giotto, 1305-1310, fragment of a detached fresco. The fragment, still of unknown origin, represents an elder woman looking upwards in grief, and could therefore be the Madonna crying beneath the Cross. 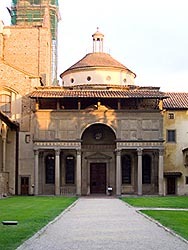 The detached fresco was delivered to Santa Croce Museum after the demolition of Florence�s old centre in the 19th century. �Face of Christ�, attributed to Niccol� di Pietro Gerini, second half of the 14th century, fragment of a detached fresco. The fragment, still of unknown origin, depicts the face of Christ, and has been attributed to Niccol� di Pietro Gerini as it is unmistakably Florentine in style. As the visitor approaches the Refectory, he enters a section called �Angels, Saints and Demons: eight restored masterpieces� comprising the eight works restored by the Pietre Dure Workshop: Nardo di Cione, Madonna with child and Saints, mid-14th century triptych. Lorenzo di Niccol�, Coronation of the Virgin and Saints, early 15th century polyptych. Giovanni del Biondo, Saint Giovanni Gualberto and four episodes of his life, 14th century polyptych. Lorenzo Monaco, Saint Jacob, 14th - 15th century panel. Rossello di Jacopo Franchi, Saint Bernardino da Siena, panel dated 1444. Domenico di Michelino, Saint Bonaventura, second half of the 15th century. Francesco Salviati, The Deposition from the Cross, 1547-1548. Agnolo Bronzino, Descent of Christ into Limbo, dated 1552. Agnolo Bronzino (attrib. ), Supper at Emmaus, The Incredulity of Saint Thomas, Pentecost, Cardinal Virtues, around 1552, altar platform, oil on board, golden inlaid frame. The painting was only uncovered in 2003 during re-organization of the store-room in the Franciscan convent, where it had been completely covered in mud. During restoration, archive documents were found associating the painting to the Zanchini Ricasoli altar in the counter-fa�ade of the basilica and the altar with the Descent of Christ into Limbo painted by Bronzino, the tempered structure of which formed the altar platform. Bronzino�s altarpiece was probably exhibited in the first display of the Museum�s Refectory together with its platform; the two parts were then separated in the second display and the platform was placed in a store-room, where it was damaged by the flood and remained until 2003. The works now displayed in Halls 1, 2, 3 and 5 were restored with funding by the Opera di Santa Croce. Scientific management of the restoration was conducted by the Superintendency for the Historical, Artistic and Ethno-Anthropological Heritage of Florence, Prato and Pistoia.